Voter deletions in Telangana is a contentious issue with much debate and many complaints to the Election Commission of India (ECI) by political parties and voters. People have approached the High Court in Hyderabad for justice, which has not yet been delivered for all those voters who could not vote in the 2018 Telangana Assembly Elections. At the center of all of these voter deletions in Telangana is a Aadhaar project calle State Resident Data Hub (SRDH). The united Andhra Pradesh state was an early adopter of the Aadhaar project implementing it in the state as early as 2010. Several pilots and projects on Aadhaar have been implemented first in the state. Many Hactivists shared their experiences who participated in the Hactivist assemblies. Their spirits are high and experiences are inspiring. I have not had any experience in past... but this 1st experience gave me a hope that i will definetly reach my goal..I think this is my first step of my goal.....I had earned 200 ruppes by selling vegetables and packing buns in bakery within 4 hours..after completing once I thought... I can achieve anything on my own and stand on that..thank you swecha for being part of my life..A lesson learned in hacktivist is.. a person can achieve only with his worth. 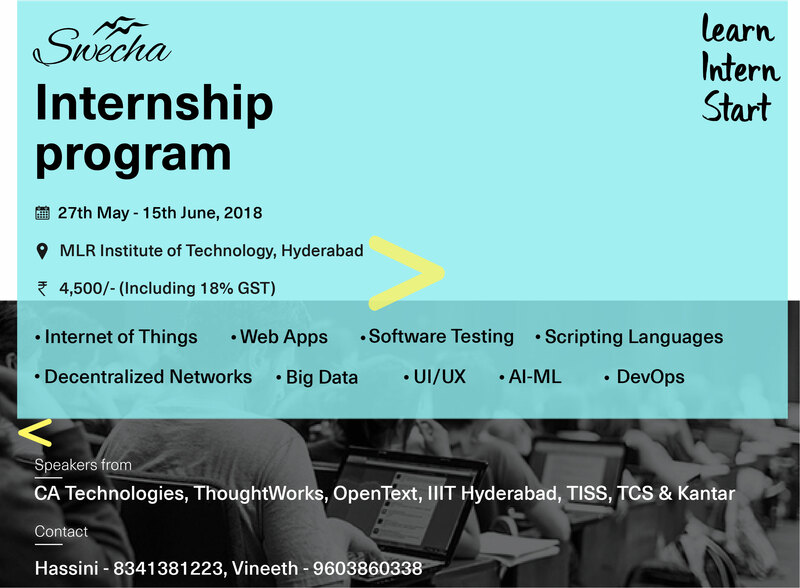 By giving this field work in a part of Hacktivest Assembly am so thankful to our swecha family....By doing this work I came to know how our parents work hard to earn money.. It has come to our notice that certain software companies/organisations in deal with colleges are mandating to collect Aadhaar details of students. These details are said to be gathered for the purpose of college management solutions they provide to various engineering colleges. The Aadhaar number is collected along with personal details such as caste, religion, gender and academic data. In light of recent leaks of various Aadhaar databases particularly regarding educational institutions , your personal data is prone to leaks and misuse. The consequences for the students and the management, of identity leak or theft are serious and enormous. Moreover, we express concern in handing over our personal data over a number these companies which are fake and act solely as data accumulating enterprises. According to Aadhaar act, unauthorised third-parties collecting Aadhaar can be legally punishable. The Supreme Court has declared Right to Privacy is a part of fundamental rights. Swecha therefore advises students, faculty and concerned citizens to watch out for these frauds and beware of them. Let's fight this together. write to us at contact@swecha.net, if such cases of forceful Aadhaar data collection drives comes to your notice. 1. 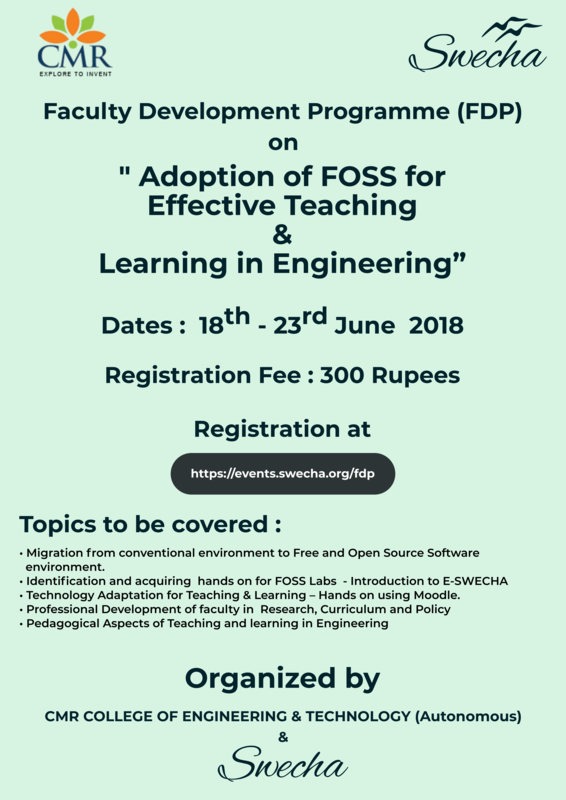 Development Program from 18-23 June 2018. CMR College of Engineering and Technology. Free and Open Source Software for Teaching and Learning.